Pictured: Jack Di Blasio and Patrick Di Blasio of 45 Spacer. Photo Credit: Matt Freuler at Wood Street Portraits. When you think of Vancouver, you probably think of the 2010 Winter Olympics, Stanley Park, and its majestic mountains, forests and ocean. Or if you’re a fan like us, you recognize it from the set of the hit ABC show Once Upon a Time. Well, now there’s one more must-see attraction that you can add to the list (or rather your playlist): the rock band, 45 Spacer. Gearing up for the release of their new single “Fly Away” on December 17, we sat down with 45 Spacer last month and talked about their beginnings, what places they’d like to play and what we can expect from their upcoming EP and sound. GALO: In 2012, both of you decided to form your band. Was there any specific occurrence or series of events that led up to this, and were there any concerns that either of you had going into this juncture? Jack Di Blasio: I guess it kind of comes across that we started in 2012, but there was a series of events before that. Patrick was at a school that really encouraged contemporary music, so he was playing the drums all the time, and I was playing guitar. And one day, we just kind of got inspired to form a band. I grabbed the guitar — [Patrick] was playing the drums — and set up my amp, and we just started jamming to a song called “Sway” by the Kooks. We performed that song at my grade seven talent show, and we just kept jamming from there. I guess it became a real thing a year after. GALO: 45 Spacer is a unique name. Is there any kind of story or special significance behind it? JDB: Well, we went through a series of names. We started out with the DB’s, then we went to Super-Fast Jellyfish, and eventually 45 Spacer just kind of stuck. A 45 Spacer is a plastic/metal insert that goes in the middle of a 45-rpm record. So we were like, “wow, that is kind of cool. It’s a musical thing and it’s old and vintage.” That’s kind of how we chose that one. GALO: The two of you range in ages, but seem very close-knit. Does your relationship with each other affect your music at all? And is there any sibling rivalry, or are you both usually in agreement when it comes to decisions concerning the band and the direction to take with your music? Patrick Di Blasio: I think it is just how a team works. It brings us closer as a team when we work together. JDB: It’s not a rivalry. There is more of a friendly competition aspect to it. Sometimes Patrick will have an idea on the keyboard, and sometimes I’ll have a riff on the guitar, and from there we’ll start writing and structuring a song. It is not a rivalry, but there is some friendly competition that pushes us both to write better songs, melodies, and all that kind of stuff. GALO: OK, so you feed off each other? PDB: Yeah, it is team work — 50/50. GALO: Going off that, I was wondering if you two would ever consider taking on a new member, perhaps to add more instrumentation to your sound, or do you want to keep it all in the family? PDB: Yes, actually, we are kind of incorporating a new member into our band right now. We have a friend named Shawn and we want to get him on the bass. He has been practicing for a while, so we are going to see if he can work with us and stuff. That would be cool if he could join the band. JDB: Aside from that, we don’t want to go too big, like [with] too many members. I think all we need now is to be at peace with an awesome bass player, a great guitarist, and a great drummer like Pat, who plays the piano now, too, which is a bonus. GALO: What about collaborating with another artist on an album or a song? Have you ever thought about that? PDB: We’ve done writing sessions with other co-writers. We’ve done a couple of those, but, I don’t know, we kind of seem to write better together as a band. I’ve found [that] most of the best stuff is when we come together and do it ourselves. It’s cool, though, when you go into a co-writing session and you get different input from other musicians. At this point, I think our favorite songs are the ones we’ve been writing together so far. We are always open to writing with new people and new artists. Patrick Di Blasio of 45 Spacer. Photo Credit: Matt Freuler at Wood Street Portraits. GALO: Noting your social media accounts and the posts and conversations you have there with your fans, it is obvious that you both hold great passion for what you do and for music in general. Do you have a preference for the music you yourselves like to listen or jam out to? PDB: We listen to everything — right now, we’re really into alt-rock and pop-rock. We learn stuff from different genres, and we incorporate what we’ve learned into our songs. We like a lot of funk, some pop…it just depends. We just saw the Foo Fighters, actually, like a month ago. They have always been a big inspiration for us — Kings of Leon, U2 and Nirvana as well. GALO: Apart from having that punk/alternative rock vibe to them, your songs also seem to have great meaning and are sung with a lot of passion and heart, such as with “It’s Not Over” or “You and Me.” Do you plan to stay within that genre or delve outside of it at some point in the future? JDB: As an artist, you are always developing and evolving. “You and Me” is a song I wrote in grade eight or grade nine. I think I was 13 years old when I wrote that song. “It’s Not Over” we wrote two Mays ago. Yeah, those songs are great. They highlight a place that we were in our lives, but a lot of the newer stuff that we’re writing has a little more edge to it. Our new songs explore new sounds and kind of fuse some genres together. GALO: Do you ever feel that putting a label or genre on an artist’s music can be a hinder to their career, such as preventing them from being able to experiment outside of their normal sound? JDB: I don’t think it hinders a band’s success. I think every band has some iconic/signature sound. When you go and you listen to U2 or to The Killers, Led Zeppelin or Nirvana, they all have their own signature thing. I think bands belong to a certain genre of music more than other genres, but it doesn’t stop them from going outside those boundaries — unless they want to stay within them. That’s my take on it. GALO: I know you live in Canada and do shows in Vancouver. Naturally, it is every band’s dream to break out of the local scene. So what are some cities or places you hope to play? JDB: We hope to play everywhere. I think as a musician you grow up dreaming to play at the most famous and iconic venues. We want to play Wembley [Stadium]. That would be incredible. Also, we’d like to play at the Reading Festival, the Glastonbury Festival, Madison Square Garden, and at the Staples Center in L.A. I think all those places are really cool, but we want to play everywhere. At the end of the day, it all comes back to the music, and our goal is to share our music with as many people as possible. GALO: You’ve played for crowds of 5,000 people at some of your shows. What would you say are some of your other big accomplishments that you are proud of with your music? PDB: Up to this day, one of our favorite shows we have ever played was one when we played at the Pacific Coliseum in Vancouver — that was incredible. 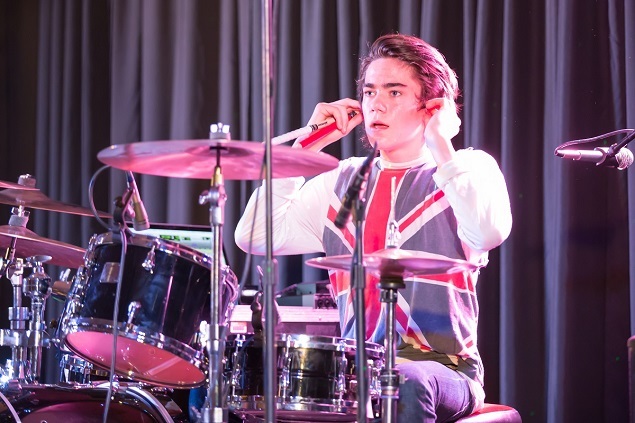 We also performed in a Battle of the Bands in L.A. with two other musicians and we won that, which was really cool. I think some of our favorite moments are about to come with all these new songs we are writing, [and] as time progresses, we will just keep evolving and dreaming bigger. GALO: What other goals do you have in mind that you would still like to achieve? JDB & PDB: We have big aspirations and big dreams. I think that our work ethic is going to allow us to get to the places we want to be. At the end of the day, it all comes back to the music and our goal to share our passion with the world. If you’re true to the music and the art, then people notice that and want to listen. That’s what we do. Again, it’s all about the music and being true to yourself and your art. GALO: What are your fans like when they go to your shows? On Twitter, I noticed you have a great deal of female fans. Would you say your fans are more diverse or does it lean more toward one gender over the other? JDB: Our fans are great when we play shows. I’d say our fan base is pretty diverse. We have fans from a bunch of different places in the world. Video courtesy of 45 Spacer. GALO: I have listened to all of your songs, which I think are very moving, passionate and meaningful, but also, they’re something you can jam out to. Your songs consist of “It’s Not Over,” “You and Me,” “By Myself” and “Naughty Boys.” Do the names of your songs and/or lyrics have a special meaning to them? Or do you rely on inspiration from various outlets, such as personal life experiences or what you see around you, for instance, in your friends’ lives or possibly even on television? PDB: I think the inspiration for our songs is pulled from different places. We both have muses. So when we go in and we write, we incorporate our feelings into them. We wrote a new song — we haven’t put it out yet, but we played it at a show we recently did. It is a newer song and it’s got more of a political tone to it. We write lyrics where we know what we are talking about. We do not try to write about something we do not know [anything] about. So, whether it’s us taking from what’s happening in our lives and putting it into a song, or what we are seeing in the world and the effect that certain political events are having [on people’s lives], we take it and we write about it. We want to make it real. We are not trying to fake our way through any lyrics, sound or song. We’re very true to our craft and ourselves. GALO: From what I have seen, your music is available on iTunes, SoundCloud and Spotify. Are there any other platforms that your audience can download or purchase your music from? And any updates on releasing either an EP or LP in the future? JDB: That’s actually a really good question. The main place to get our music is iTunes, or you can stream it, like you said, on Spotify and all that stuff. There are videos on YouTube. There are a bunch of old YouTube videos of me playing songs that we both wrote when we were really, really young that we taped with me playing on acoustic guitar. PDB: We are in the process right now of building an EP, actually. We are trying to create as many songs as we can. JDB: Well, right now, we have 20 to 30 demos on Patrick’s computer. We are working on writing all those [ideas], and then taking the ones that are our favorite and finishing them. So, I think fans can expect an EP in the next little while. GALO: Now, Jack, I know that you have done some acting and modeling. In fact, you’ve tweeted some of your modeling shots and announced when you were to appear on the hit ABC show Once Upon a Time, so I am curious if both of you plan to stay in the music business, or do you have other plans for a career or interests you would like to pursue in the future? JDB: Our main passion is music. Until the day we die that is something that we are always going to love. If other opportunities come up and we like what the opportunity is, of course we are going to take it. But right now, our biggest focus is music, and creating songs and writing the best we can. GALO: So not to regurgitate what we already spoke about, but there has been talk that you are working on some new music and an official website. What can we expect from both? Any chance you can tease a bit about the type of sound we can expect from these new songs — is there any change in direction? PDB: I think our sound is evolving. The music still has great pop melodies, great little hooks and lyrics. It is still rock-pop, but it is more edgy, and you will hear more violins, synths and stuff like that. That’s where we are at right now. 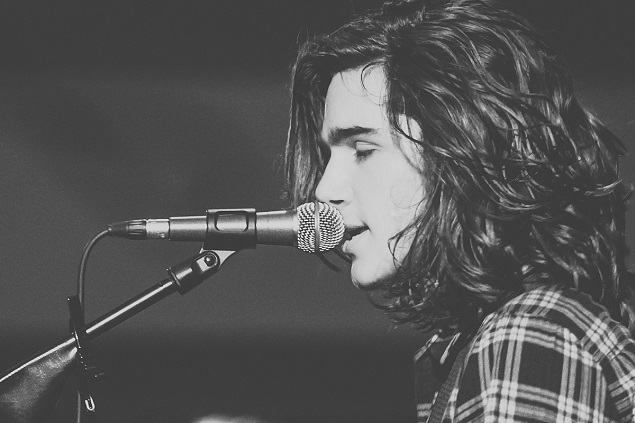 Jack Di Blasio of 45 Spacer. Photo Credit: Matt Freuler at Wood Street Portraits. GALO: What about the website you are planning on launching? PDB: We have to finish a couple of things. We are working on a bio. That will be coming up pretty soon, too — in the next couple months. GALO: What types of things might we find on your site — do you plan to sell merchandise? PDB: We want to sell merchandise on it, for sure, like t-shirts and stuff like that. [We’ll sell] CDs, and generally we just want to get lyrics on there and some songs. We’ll put some new stuff on there, like show dates and all that stuff. It’s going to be a typical band website with all the basic information. GALO: As much love as you have for music and your band, what are some hobbies outside of it that you enjoy indulging in? JDB: I don’t have too many hobbies outside of music. At this point, we are writing and producing songs nonstop. We are down in the basement working really hard all day, finishing songs and rehearsing for shows. PDB: There are not many things that we are doing besides that. GALO: So basically outside of music, your hobby is music [laughs]. That shows true passion. Finally, are there any interesting facts your fans would be surprised to know about either of you? JDB: We actually have been writing — we aren’t sure if it is going to work out or not — for some artists who need some songs. We are writing for ourselves, but we have some people who want us to write for them — whether they’ll use the songs or not, we do not know. Also, we are planning a tour. It is going to be a West Coast tour. We are going to try to get on the East coast, too. GALO: What about on a personal note aside from music [laughs]? JDB: I just finished midterms. [Laughs] Right now, it is a lot of music stuff. GALO: Well, we wish you guys a lot of luck and success, and hope to see you play in New York City one day! To purchase 45 Spacer’s songs, you can visit their iTunes page here. 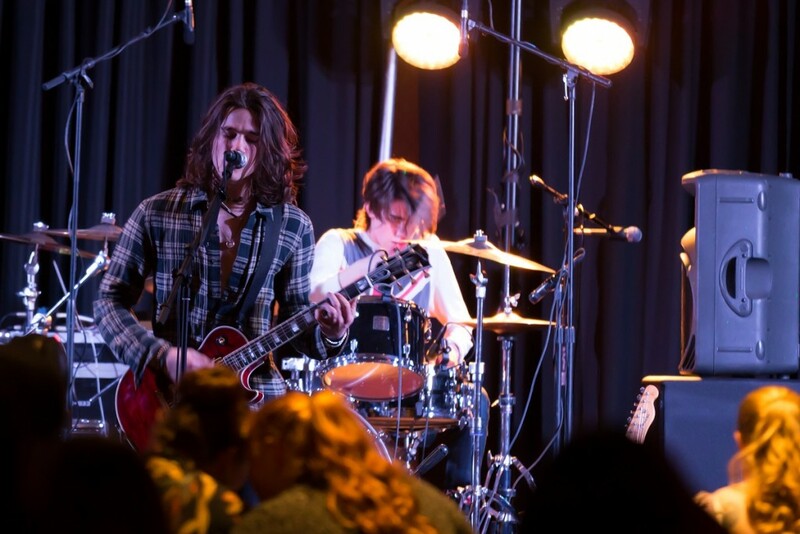 For more information about the band and what they’re up to, follow them on Twitter @45_Spacer.